Ethereum blockchain is the internet’s government, and smart contracts are its laws. To understand Ethereum’s profound implications, let’s examine the functioning of this new internet government. Laws in Ethereum blockchain work a little differently than laws in traditional governments. 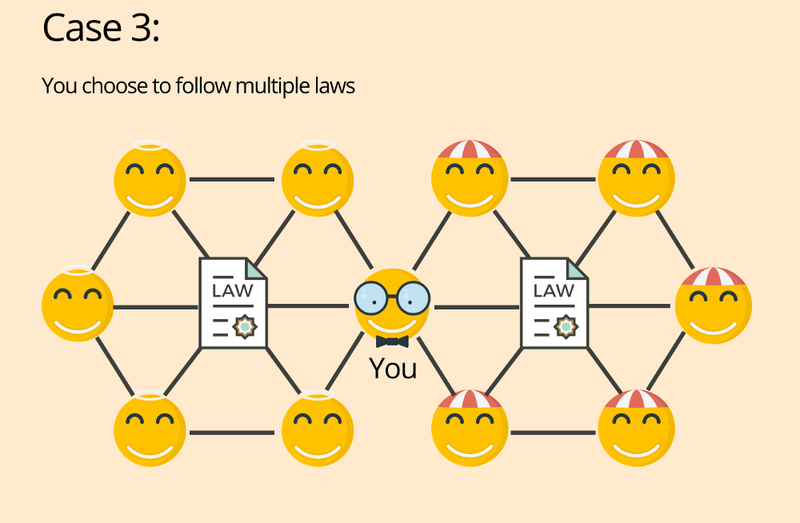 First, in Ethereum laws can be created by anyone. That means you, your neighbor, and President Obama are all on equal ground. These laws are traditionally called smart contracts. They are written in code. The code is just a language in which there is no room for interpretation unless explicitly authorized. So if you learn the language, congratulations! You are now a member of the legislative branch of the internet government. Once a law is written, it must be enacted by the government’s executive branch: a network of computers running the Ethereum software. You must pay the computers upfront for the cost of enforcement. However, it is extremely cheap. It costs about half a penny for a law to be executed and enforced. So if you’ve got half a penny to spare, congratulations! You’re now in charge of the executive branch. But wait! There’s a catch. Creating a law doesn’t mean everyone is going to follow it. All Ethereum laws are opt-in. For your law to be adopted, you’ll need to convince fellow citizens that following your law is in their interest. You must also decide which laws you choose to follow. Good laws will provide distinct advantages to those who follow them. They allow for cooperative action and greater trust within the group. If you (a passenger) assault your driver, and they report it, you are kicked out of the service. If you are reported but you file a counterclaim within one day, you will be appointed a random arbiter to resolve the dispute. These laws provide the protections required to organize groups with minimal overhead. These diagrams get much more complicated when one law depends on another. For instance, to be an Uber driver you also have to follow the insurance laws. 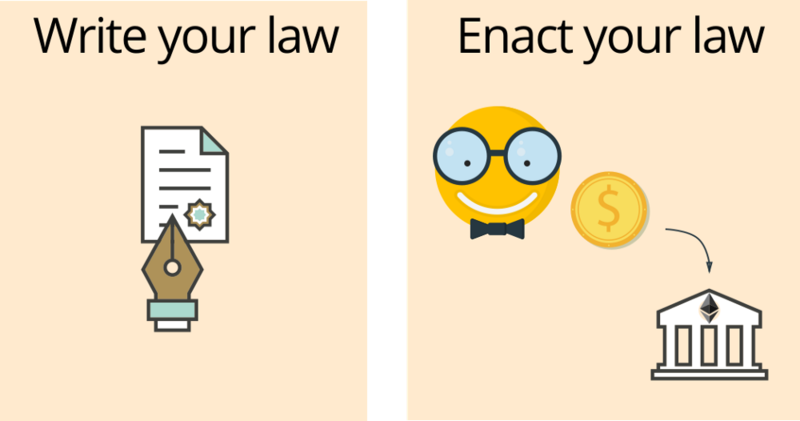 While this might be hard to represent with cute smileys, this is how the internet government will be able to handle the complexities of modern governance. The internet government has another interesting property: it is impossible to break laws. All laws are executed exactly as they are defined. For instance, in our Uber example, having an assault filed against a passenger will always cause them to be kicked out of the service. It doesn’t matter if they are a new user or the president and founder of Uber. This is great for battling corruption, but sometimes corruption is not the problem. Many laws are poorly designed or unfair. These laws are also executed exactly as defined. This may seem terrible, but it’s essential for weeding them out. It is easy to identify a bad law if following it is actively harming you. I would be broke in a week if I had to pay a fine every time I jaywalked. While it is impossible to break laws, you can explicitly choose not to follow them. Remember, all laws are opt-in. This provides a simple mechanism for weeding out bad laws: they simply cease to be followed. Governance is one of the most ancient conundrums of humankind, and it is by no means solved. Inequality, injustice, and corruption have been defining features of the modern era. Today humanity faces some of its most difficult challenges. We will need effective governance if we want to stand a chance. The internet government is probably our best bet. With low-cost opt-in laws that cannot be broken, for the first time, we can easily apply the scientific method, trial, and error, to governance. Laws being opt-in means they are under every citizen’s scrutiny. Laws being unbreakable lets us accurately measure their effectiveness. Law creation being available to everyone means new laws can rapidly replace old ineffective ones. And then we repeat. We will be able to turn governance into a science and discover laws that are effective and fair for all. Ethereum is not just the internet’s government, it’s yours. This article was written by Karl Floeresch, Ethereum developer at Consensys and originally published at karl.tech on December 8, 2016. Karl Floersch specializes in the development of blockchain systems, focusing on Ethereum. His experience prior to blockchain had him engineering software for clients including Macy’s and SC Johnson, and working full time with Citibank and Riverbed Technology. After graduating from Stony Brook University with a degree in CS, Karl has contributed to the growing Ethereum software ecosystem. He maintains an Ethereum focused blog, karl.tech, and is active in the Ethereum community. He is driven by the opportunity to build a better future, which Ethereum provides. Fantastic article and wonderful conversation. Thanks for all.